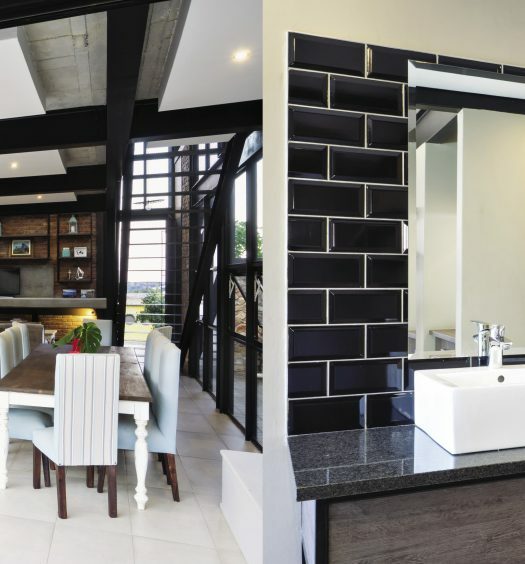 Even though this house, located in the Waterfall Country Estate in Midrand, is modern and open-plan, it is every bit a family home. The kitchen is the heart of the home. “The kitchen is my favourite room in the house, because it is large, light and spacious, and we spend the majority of our time there. It has a large, built-in table that is used not only for meals, but also as a homework and arts-and-craft spot for the children. In this way, I am able to keep an eye on them while I prepare dinner,” says the proud home owner. The kitchen is also integrated into the living area, where it shares a stylish and trendy double fireplace with the TV room, and also opens out onto the entertainment area outside. The home owners say: “We wanted a modern, airy and open-plan home where the interior would flow seamlessly to the exterior entertainment area. For this reason, we added glass stacking doors to our downstairs area.” This modest, yet stylish home, with a muted white, brown and grey palette, effortlessly combines hard elements such as concrete, metal, glass and wooden floors, and stone cladding on the outside walls, without making the home seem harsh and uninviting. “We wanted our home to be clutter-free, with minimal furniture and decor. The use of large windows throughout the house provided lots of natural light, making our home bright, calming and inviting,” they say. This dream house was brought to life by Bobtons Construction, using a “healthy mix of steel, brick and concrete. “This ensured that the client’s brief of a modern home that transcended boundaries and would be on the cutting edge was beautifully achieved,” says the company’s owner Jason Truscott. The home owners chose to design an L-shaped home in their narrow, rectangular stand, to take advantage of the space and to ensure comfortably sized bedrooms. The main bedroom and the living areas are all north-facing. Bobtons Construction also recommended incorporating a glass staircase and bridge, as well as a feature wall in the entrance, to add to the contemporary feel of the home.